Made Microsoft relevant to students by convincing them that we transform a marketing portal, into a a story & insight-sharing platform—helping upcoming graduates enter the professional world. Role: Creative Lead / Content Lead. Channels: Digital. Content. Insight-Sharing Community. Microsoft wanted to win the interest of students to become Microsoft Office customers. But at the time, Microsoft was considered one of the least-liked brands by that group. We faced the additional challenge that the previous version of their student website was created only 6 months prior (by another agency), and was not doing well. 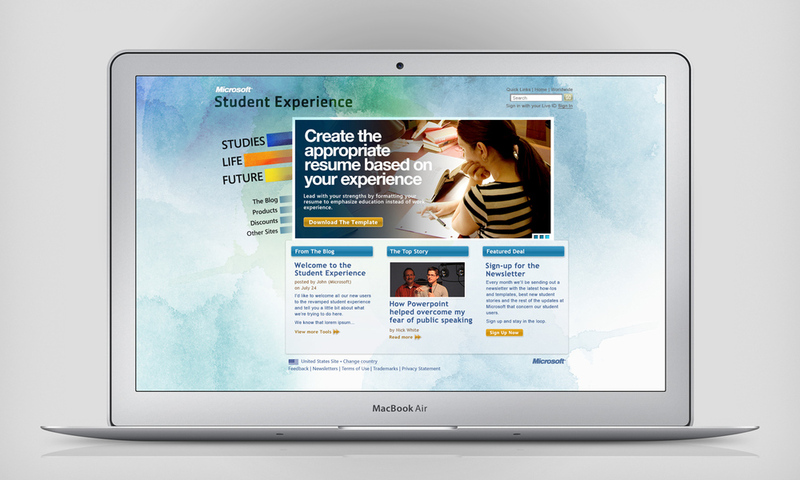 Microsoft and McCann wanted a design solution to make it ‘cool with students’. I proposed that a design-only superficial solution wouldn't have an effect on a savvy student generation who isn’t affected by traditional advertising models. I proposed that we create a platform filled with useful resources to help students navigate that difficult transition between finishing university and starting their professional life. The content would be in Microsoft Office docs format, and given freely. So the product would prove itself useful and sell itself. I had a great ECD and Lead Strategist that were on board with my suggestions from the start. But since we were proposing such a huge change to Microsoft, understandably, we had to convince the rest of McCann. Once we presented to Microsoft, the lead client yelled in excitement! 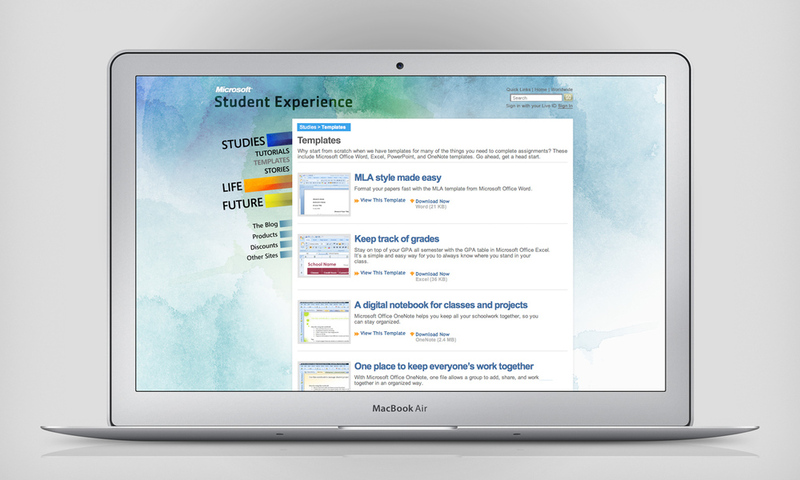 So we transformed Microsoft.com/Student from being a digital (but fundamentally traditional) product marketing portal telling students how great Microsoft products are – into a platform using Microsoft Office to give students: free tutorials, templates and shared field stories. Insight tools, helping them prepare for interviews, mange their student budget, share field stories, and transition into the professional world. *See the website images for content examples. 322% Increase in product offer engagement. 49% Increase in unique visitors. 18% Increase in homepage landing engagement rate. 40% Increase in average page views per visit. I'm interested in activating communities of audiences sharing circumstances. And often champion a natural interaction between those communities and a promise that a brand can genuinely fulfill. I recruited McCann's interns to help us develop the type of content they needed as they began their lives in the professional world. We then recruited students at universities to further develop and own the platform. *McCann used this project as an agency best example, and I was invited to join their team as a full time Creative Director.